In its early years, Doctor Who often told overly ambitious stories that the budget and effects couldn’t quite match. In fact, it’s part of the distinct charm of the classic series in general, and while there will always being certain episodes and moments that suffer from this more than others, very rarely does the credulity of the effects really affect the story being told. 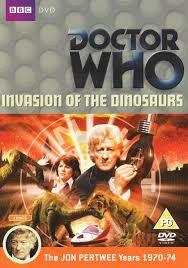 The transition of the Pertwee years to a more Earth-centric format alleviated this to some extent, the thought being that the budgeted effects would be more prominent and distractive in colour, but ‘Invasion of the Dinosaurs’- by its title alone- draws intense focus to the effects bringing the dinosaurs to life in modern-day London, letting down fans expecting to see something more realistic and even failing to meet the expectations of the production team. Looking past the puppets, costumes, and Colour Separation Overlay employed for the dinosaurs that are so clearly the root of this tale, ‘Invasion of the Dinosaurs’ is one of the few Pertwee tales to really embrace the concept of time and time travel. Here, a group of people is determined to rewind time back to the prehistoric age in order to rewrite history as its members begin civilization on their own terms and in their own image. The Golden Age taps into the idea of many people feeling disconnected from the world at large as advancements are made around them, an intriguing element with which almost anyone can relate. However, Captain Mike Yates’s belief in this group’s aims, disregarding his companions and considering his life worth the sacrifice if the plan to rewrite history succeeds, does not carry the emotional impact that is intended. It’s an intriguing plot point to be sure, but not enough characterization of the UNIT team’s members- aside from the Brigadier- has been afforded over the previous years to elicit the same sense of betrayal from Yates in the audience as is apparent in Lethbridge-Stewart and Benton. There’s nothing to explicitly explain where this sudden thought process came from, but there’s also nothing in previous stories that makes it seem wholly impossible either. This is a case where the UNIT uniform itself is asked to carry more dramatic weight than the story affords the individual wearing it, drawing attention to just how anonymous these familiar characters within the UNIT family still are while also firmly disrupting the sense of comfort and family at the heart of this era. In a way, ‘Invasion of the Dinosaurs’ hearkens back to the early Pertwee stories while also seemingly criticizing the more fantastic and action-oriented approach the era started taking as the years progressed. For the first time in a long time, the Doctor and the Brigadier really seem at odds with one another, showcasing their very distinct philosophies and outlooks on life. The Brigadier, in particular, seems rather accusatory in the midst of UNIT declaring martial law and taking matters into its own hands. The script does at least show that the Brigadier does not share the more extreme intent of his superiors, but his begrudging willingness to accept orders again calls into question the establishment allegiance of the Third Doctor and how radically different the Time Lord truly is from the military men he has surrounded himself with over the past several years. Wisely, though, the script calls attention to the fact that Yates and his colleagues are simply being reactionary by hoping to eliminate the state of social decay by starting completely anew, not addressing the underlying cause of what has led to and created this state. Even if the story ultimately doesn’t explore the rampant looting as being the result of a corrupt government or some perceived social justice, instead opting to rely on the dinosaurs as the cause, there is at least the hint of an intriguing underlying thread tantalizingly left unexplored. As Sarah Jane and the Doctor slowly uncover the brutal truth behind Golden Age and its supporting government officials, the story provides an intriguing allegory to the Pertwee era as a whole. Though only the second story of this farewell season, there is a distinct sense of finality about UNIT as a concept as its team is slowly eroded away along with portions of the world around it. The Third Doctor is slowly distancing himself from his Earth-based adventures, still offering his morality when needed but also putting Earth’s citizens more in control of its planet’s fate. The dinosaurs and the plot twists may not be nearly as effective as intended, but ‘Invasion of the Dinosaurs’ offers an intriguing spin on a rather traditional format.